Welcome to Garden Bloggers’ Bloom Day for August 2010. I wrote in 2009 that August is what separates the real gardeners from the wanna-be gardeners. It’s hot and dry and who wants to be out there now? In comparison to this year, August 2009 was actually quite pleasant but not as pleasant as August 2008 and August 2007. I hope we return to some Augusts like that next year becuase this August is not so nice. This August the garden reminds me of the resilience of plants, how little help they actually need from us gardeners, how much they can endure and still bloom. 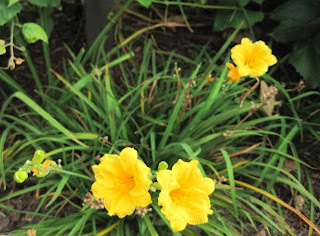 Above is that common as dirt daylily, ‘Stella D’Oro’. One afternoon back in the spring, I grabbed a shovel and attempt to evict all of these "stellas" from my garden. Not so easy! A few roots remained, clung to the soil, pushed up shoots, and bloomed. And they bloomed all summer long. Where lesser plants have withered in the heat, these keep going. So I’m going to let them stay. But just a few of them! Elsewhere in the garden, a clematis, variety unknown/forgotten, is blooming. The freshness of this bloom with drops of water clinging to it is deceiving. Few flowers are fresh or damp in my garden this month, except those like this clematis that I’ve been watering daily. It’s hard to see in this picture, but this clematis is sprawling across a long container holding some 4” pots of trial plants that I’m planning to plant this fall. What makes this clematis so remarkable, so resilient, so worthy of this much attention? In late June when the crew came to install the new patio, they told me they didn’t think they could dig this up where it was, so I told them to cut it back and shrugged it off as a loss for the greater gain of a newly designed garden. So they cut it back, and I thought no more about it until one day it was back, covering these other plants, and now it's blooming. 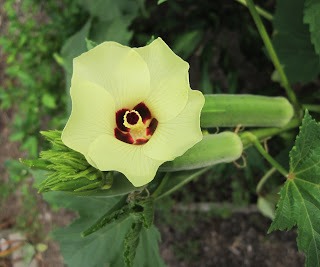 Out in the vegetable garden, the okra seems oblivious to the heat and can be counted on to have blooms each day. As long as I keeping cutting off those pods, I think it will keep blooming until it is knocked back by frost. What else is blooming in my garden? What else has the resilience to stand this heat and dryness? This is ‘Autumn Beauty’ from Botanical Interests seeds. It's tall. These are several different varieties from several different sources. The bees and butterflies both love them. They are a nice subtle buttery yellow, much nicer than that garish yellow gold of the "stella" daylilies. Elsewere I am also enjoying, mostly from inside the house looking out into the garden, the usual marigolds, coneflowers, phlox, black-eyed susans, hostas, coreopsis, salvia, golden rod, yarrow, and hydrangeas. They all have the resilience to bloom in hot, dry August in my garden. Some of you are not seeing your link on Simply Linked. Here's Mr. Linky, back in businss. Someday, I might combine these two lists. Anyway, link on whichever one you'd like and sorry for the confusion and mess! August is no problem-o for coastal gardeners. If anything, summer here has been a total fail insofar as heat goes. I haven't picked a single tomato. It's too cold. In fact, I haven't had a good year for tomatoes since 2007. This fall, I'm converting to blueberries. Yay for the resilient Clematis!! I've found Clematis I thought I'd killed dead come sprouting back from total neglect after a year or two (i.e., I neglected to dig out what I thought was a dead root ball). Neglect can be good in the garden of resilient plants. I can't keep a clematis alive so I envy yours. That sunflower shot is striking! This summer is very hot - August no different, but still some flowers aroud. I really like your okra flowers! What a weird August. So many people are sweltering but then California is wondering where summer is. Fortunately for us it's still pleasant working in the garden. I've always loved oka flowers. Yours is a gorgeous example. Hibiscus-like flowers followed by tender edible pods--almost a perfect plant. 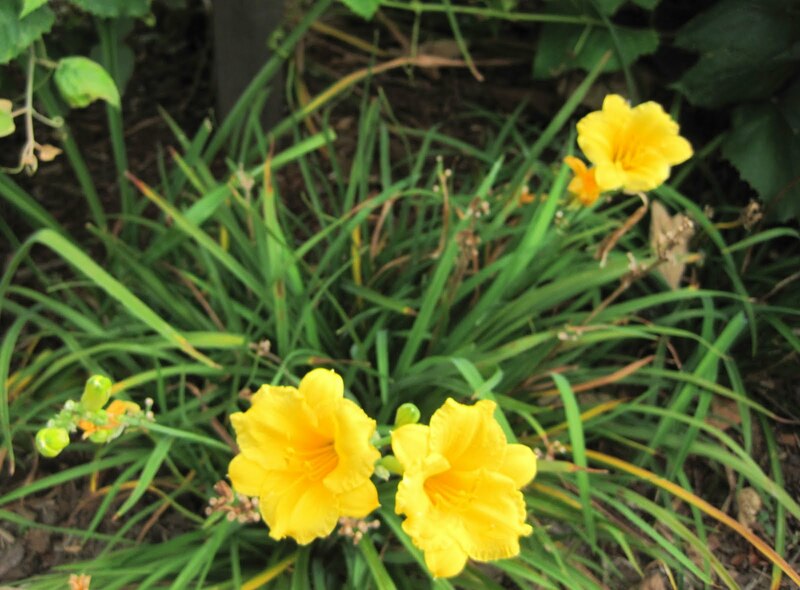 Wonderful story about that daylily. In fact, the very same happened to me this year. And I've left them alone to bloom someday in the future. August is definitely a survivor type month; both for garden plants and gardeners. Thanks for hosting Bloom Day. Hi Carol, after a very hot, dry June, North West England has returned to type, with a cold, wet July and August. The okra has a beautiful flower, and your zinnias look much happier than mine. Happy GBBD! It's definitely been a tough garden year in my area of VA. Very hot & dry. You find out which plants are the toughest in these conditions. Thanks for hosting GBBD! I posted in June, but then skipped July. Here I am back again. So strange hot terribly hot the rest of the country has been. Here in the PNW we are finally have a short little spate of heat. It hits us just so that everyone can complain about how hot it is, and then it goes away so that everyone can wonder where summer went. I love it when plants that you think are dead come back to life! So glad it happened with your pretty unknown Clem. August's certainly been a challenge this year in south-west England Carol as we had a 10 week drought until the rains came this week! I love your sunflower shot, Carol. This Bloom Day is a great opportunity to give thanks for surviving another crazy summer. Thanks for hosting! We've had virtually no hot sunny days here in Scotland for weeks - constant showers with July breaking all rainfall records. Despite this the garden is blooming well..... weeds too - but my neighbour decided to use her sun parasol for something much more useful which you'll see on my blog. Anyway here is my link as I don't see Mr Linky up yet. This is my first contribution to Bloggers Bloom Day and I'm really pleased to be able to share what's flowering in my New Zealand garden with such a happy bunch of garden enthusiasts. I like your story of Stella D'Ora, but I am not a huge fan of that plant. Sometimes when I try to get rid of something I have grown tired of, and it comes back, I get a new respect for it. Although, that doesn't necessarily change my mind about getting rid of it. Mr. Linky is apparently under the weather so I will post the link here and will check back later when he is out of bed. Thanks for hosting Bloom Day. Although I think of late June as my garden's peak time because of all the roses in bloom - hence the Annual Rose Viewing party - but as I look back, it turns out August is also a great month in my garden. Only right and proper since it is my birth month. Yesterday I bought and planted more daylilies so the daylily bank is finished, and I have more garden phlox - always good in August. happy to be back on the GBBD, and enjoy so many gardens from all over the world thanks to Carol's brilliant ideas and her intriguing posts. Okra has beautiful flowers,I never realized. 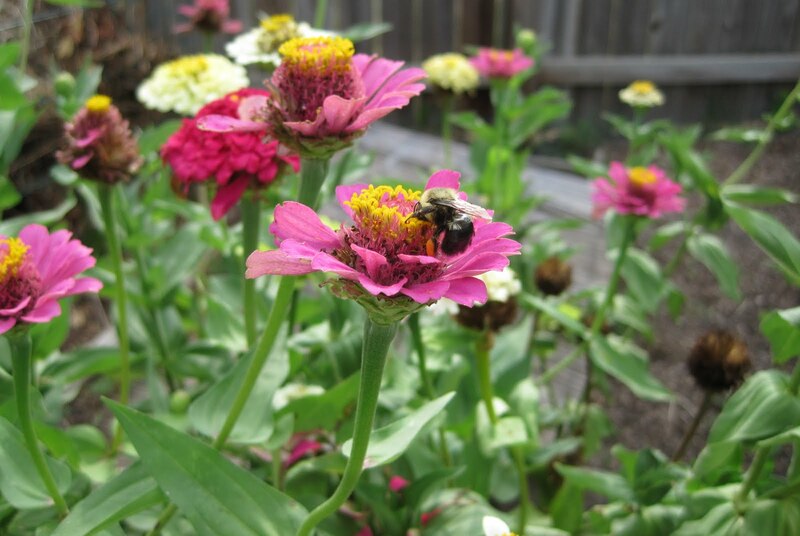 And your raspberry zinnias, yum. 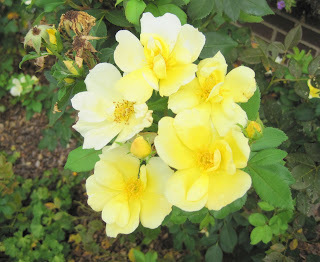 I am glad to be a part of your Garden Bloggers'Bloom Day, such fun. It's sure been a long, hot summer Carol. I'm amazed how well our gardens are doing in spite of the heat. I concur with everyone else who noticed how beautiful those okra blooms are. Thank you for hosting Bloom Day! p.s. - I like Mr. Linky better, since the link shows up right away. There's a bit of a delay with Simply Linked. Nice though, that there are alternatives for those times when Mr. Linky is down. I enjoyed your post. This summer really has been about the weather. First, spring came late, then it rained, at least here, 6 inches above normal. Then the heat came, and the poor plants didn't know what hit them. I love your sunflower photo! Thanks for hosting bloom day. My garden is suffering from neglect, not because of the heat but the mosquitoes :( Luckily the rain and humidity are making the plants remain lush, and I have not been beset by powdery mildew yet (knock on wood). All in all, it's been a pretty good garden year! Can't wait to see the finished product when your garden design transition phase is done! August has been tough here, too. Sweltering temps and then a week of strong storms have really taken their toll. Natives are thriving, "fall" plants have started blooming, and some summer favorites are making a second showing. I agree with you about August -- any garden can look good in May but August is another thing altogether! Happy GBBD and now I'm off to find out where LC lives, where they are having cool mornings and no mosquitos! Love the ochra bloom; don't think I've ever seen those before! August is supposed to be hot and . . . "dry?" What is this "dry" of which you speak? I haven't grown okra since moving from PA 8 years ago, and have never thought about growing okra just for the flower. I think I'll have to start again next year, maybe some in the vegetable garden, and a few in the border. Very charming. Hello Carol! The clematis is beautiful. August is a month which is usually cloudy here, so it is good or gardeners. Glad to see the Knockout looking so pretty; am thinking about getting a yellow one next year. Apologies for the linked Grow It Eat It post because it is more about a lack of (bean) flowers than actual photos of flowers! Thanks so much for hosting and posting! I am not really a fan of eating okra, but that bloom is beautiful! Maybe I'll have to try it again. Glad to know I'm not the only one, Carol. And that even with the dry weather, lots of beauty has emerged in your yard. I know I'm not gonna attract anyone to my blog with photos of dried out hydrangea (yes I actually posted a photo of them!) but I do have a cardinal vine that I'm showing off. Arent' the okra flowers gorgeous? I love their creamy colored petals and the burgundy center. Carol, Happy Bloom Day! This summer certainly has been an interesting one for the garden, hasn't it? Like you, it's made me appreciate some of the overlooked, but tried & true plants, like Stella. Every garden needs some of these die hards that don't give up on us even when we'e had enough of them. Hey, just a note to say that I submitted my link about 20 minutes ago and it hasn't popped up yet. I wonder if anyone else is having trouble. I like the Mr. Linky site better. Thanks again for having this wonderful monthly event. But I love those yellow daylilies! So cheerful, so sunshiney! Makes me want to dance, they're so happy! Happy GBBD, Carol. As always, thanks for hosting. My area of CT is dry, dry, dry but some stand-bys, anemone and coneflower for example, still bloom. I can't imagine an August garden without them. I tried t o post my link, http://www.joenesgarden.com, but don't see it on the list of contributors. Wonder if others are having problems? August Bloom Day just an explosion of gorgeous out there. Usually everything has started to fade and turn over to the fall plants by now, but the extended heat has just kept the blossoms going, including my amaryllis blooming outdoors for the first time. Haven't gone through the links yet, but I'm ready to be dazzled! I don't count myself as a wannabe-gardener anymore, but darn, it's hard to get too motivated this August. You're right, Carol, that this is a month where we really see who are the strong that will survive. I forgot to include some Stellas in my post, but you've got to love a plant that is this tough and keeps on going. I didn't realize okra had such pretty blooms--that's reason enough to plant it. And I'm so jealous of your zinnias! My favorite flower in August, but mine didn't make it this year. Happy Bloom Day to you, and here's wishing for a September full of sunny days in the 70's! Carol - what a rally for this month's GBBD! My timing seems to always be off (already posted for today), but I will go back and update the post to link up to your post today! It's always a great visit. Hi this the first time I've added the link to my bloom day, I hope you enjoy my garden. In Italy August is when anyone with any sense (and no vegetable garden that needs attention every day) head for the beach. Anything that flowers is a bonus, I just hope things don't die. Great to see so many August entries. And okra is going on next year's list. Thanks, Carol. Yes, August is the month that you appreciate the survivors! And if it can bloom in the heat and look uncooked, definitely a keeper. 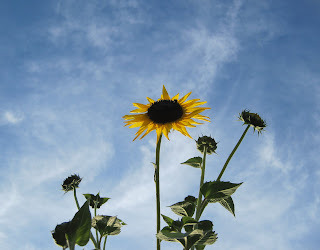 Love the sunflower against blue sky, and okra flowers are one of my favorites. Thanks for hosting, Carol! Austin's back into the 100s, but I've got a few things blooming & my gbbd post is now up. I love okra flowers! Your clematis is lovely, too. My GBBD post is up and looking back over it, all I see are tough, tough plants! Yes, this is definitely the month we appreciate them - and you, Carol, for hosting GBBD once again. Thank you for hosting this Carol, it's my first GBBD post so I hope it looks good! August is a little dull in my northern Illinois garden this year. I think that next year, I will add more annuals to my beds to keep things fresh. Thanks Carol, for hosting Bloom Day. What a lot you have blooming in your garden now Carol. I am impressed, especially since your garden has been going through a remodel. I'm sorry your summer garden is struggling as much as mine. At least you've got a nice patch of Zinnias. In my garden, it's the Phloxes that have had the resilience to stand up to the difficult weather. They always manage to look fresh. Love the okra. Edibles always have the best blooms - I have some stunning ones on my Fairy Tale eggplant. August is a tough month here. More annuals next year although they do require a bit of water to keep them looking fresh. It's been my kind of summer here in Michigan!! Hot and sunny..of course we could use some rain but I have been watering my flowers faithfully and so far so good!! Love your photos!! Love the monthly garden bloggers' bloom day!! So glad I found it!! I wilt in the heat too...enjoying your intrepid blooms from the cool of my basement studio. Yes, it's been a rough summer here in the Midwest. It's the time of year when I want to rip everything out of the garden because it looks so ratty. Yet, there ARE good looking blooms to be found. 36 of mine are here. After complaining incessantly about the cool, wet weather we had in Maine last summer, it seems churlish to complain about it being warm and dry this summer -- but I guess that's the nature of gardening; we're never completely satisfied with what we've got. Actually, the weather here now is gorgeous; we just need rain. Like so many others, I'm finding my garden looking a bit more tired than it normally would at this point. Made it just in the nick of time! A little late posting about the native plants in my western New York garden. Thank you, Carol, for hosting GBBD! LOVE the okra blossom. I may turn my entire garden into an okra field next summer, ha! A big round of applause for tough plants. If it wasn't for tough plants, I wouldn't have a garden this year. Love the zinnias! You have a nice collection of flowers. I forgot to plant sunflowers this year and I let our clematis dry out, so I'm jealous of both of those. I'd also like to have some of the heat you guys are getting. We're foggy and cold this year. Thanks for hosting bloom day. August is usually a very pleasant month here, although I wish I could find more flowers that bloom in August. I get bored with what I have. It has been pretty dry for August this year so I just make sure to water, water, water. K - I'm with ya on the Stellas, but you know, you do have to give them credit for their tenacity! Your other yellows - the Sunny and the Sunflower -- are both lovely! Thanks for hosting! I'm not at home this weekend, but I'm posting what I can find where I am. Looking at your pics, I think I need a 'Radsunny'! Compared to much of the rest of the country, we here in Southern California have had one of our coolest, mildest summers. Still with no rain since April or so, it is kind of dry! I don't water much so many of my native plants have gone dormant. There is beauty in late summer, even when it comes in browns. So nice to be part of this garden community - sharing our passion for plants. I just finished writing my post! The pictures are from PA and the house my family and I vacationed in. This August may be too hot for man or beast but not for okra, as you can see! The hotter it is, the better it gets. Right now, it's about the only produce that every farmer has at our farmers' market. Love your rose! For a moment there I thought it was too hot for Bloom Day if I made it in there under 100. Then I saw Mr. Linky below. Well it has been hot, like 85 degrees consistently for high temps. Hot enough for me to possibly obtain for the first time ever a full sized melon. 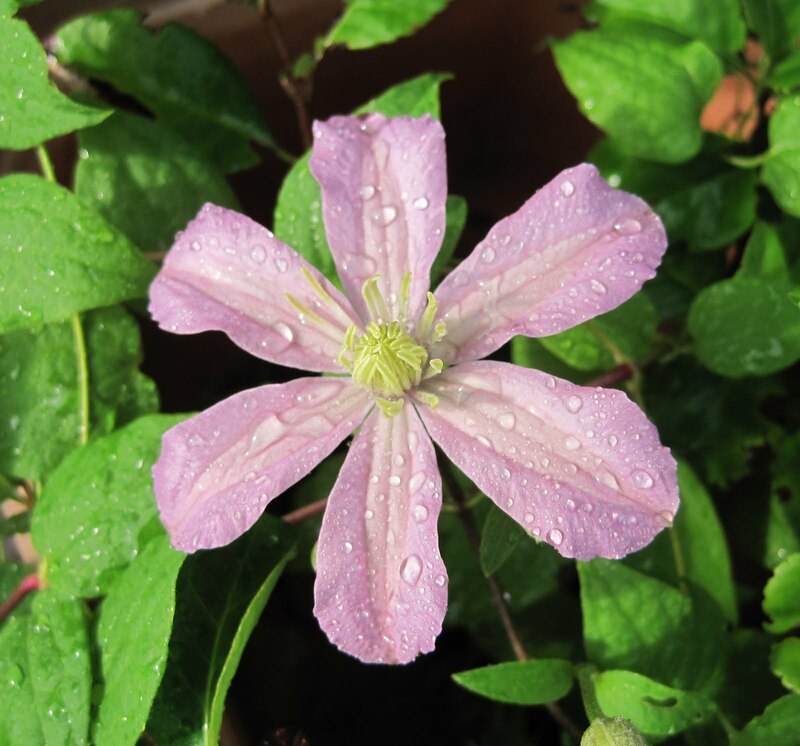 the clematis is really stunning - it's such an unusual but cool color - just what we need this month! happy bloom day. I was actually pleased to see that I was not alone in my sufferings for this August. I'm quite ready to move on to a rainy (I hope) September. It was really an effort to find flowers worth mentioning this month. Thanks again for hosting. I love the sunflower in front of the blue sky! Love your sunflower reaching for the sky! August has been brutal here, but a few survivors! Thanks for hosting another fun Bloom Day! The hot days of August make gardening less appealing, but they also provide the perfect motivation to ripening tomatoes. I'll keep them! Gosh, I'd happy trade a day or two of our cold fog for some actual day of summer heat. I enjoyed the photo of the okra. I've never seen it grow before. We've had the relief of some cooler weather and a couple of rainy days this week. Hope your turn comes soon. Dry is miserable! That's one tough Clematis! Pretty too. I like that subtle buttery yellow of the "Radsunny" Knockouts. Gotta love a girl as tough as that! August does indeed reveal the toughest of the lot of the plantings, and the gardeners that can get out there and tend them. The weather is the subject, taking center stage, whether too hot, too cold, too dry or simply too. Happy Bloom day, a day late. ps, I like Mr. Linky better, seeing the link immediately. Our backdated contribution to August's GBBD: http://localecologist.blogspot.com/2010/08/garden-bloggers-bloom-day-montreal.html. We're so excited to be participating for the first time! So far, two of us with very different gardens (one rural, one urban, one perennials, one vegetables) have posted what obliged us on August 15. Thanks for this great idea! So sorry, Carol - got the post up late last night but forgot to leave a link. Oh, that Radsunny looks wonderful! Guess the way both the Stellas and the clematis bounced back after such drastic treatment means that the plants cannot bear to be voted out of May Dreams Garden. The verification word is "rudist"... is that someone who takes off their clothes when other people don't want to see a naked body? I love your photos! The okra intrigues me. Thank you for hosting this. It is wonderful to see all the different gardens and blooms. Hey, thanks for the blogging fun, love to see what others are up to, and you are a gracious host. I also had a 10 ft tall sunflower, then a storm took it down, it is now a 1o inch sunflower growing horizontally with about 20 blooms on it. Guess you can't hold back mother nature! Back home and had to post again, showing my _actual_ garden. In my haste, I spelled my name wrong in the linky thingy! Thanks for hosting this each month. I love looking at everyone elses blooms, and I need the structure to keep up with my own photo log. I'm comforted to see that you've forgotten the name of a plant too! Nice pictures! I love the sunflowers and the angle on how the sunflower is taken. It shows that the sunflower is really tall! I would love to have a dozen of sunflowers in my garden! That would definitely make my garden a certain eye-catcher! Happy Bloom Day, Carol. Waiting to see my link...http://tengablescottage.blogspot.com/ Love the flowers you posted. It is so hot here in Florida that I only have a few things blooming. I love your Stella D'Oro story. They are such hardy things. Last year I ordered some for fillers in my garden. One was so tiny that I thought it would not survive in the hot sun and even died back. Now, there it is with lots of new growth. I certainly wish that I could grow okra here. The evenings are too cool for okra to do well. Everything else is just lovely as usual.